LONGVIEW BAPTIST TEMPLE has an Annual Preacher Boy night, the Wednesday before Thanksgiving, where a few selected teenagers who are called to the ministry preach. These young men did an excellent job of preaching last night! 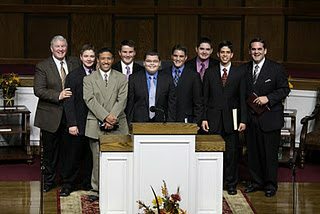 David Dean, David Vazquez, Cam Batton, Noah Quintanilla, Jordan Gray (grandson), Jacob Dean, Richard Rossouw, and Pastor Gray II. The service started at 6 pm and went immediately into the preaching. GOTTA LOVE OLD TIME PREACHING! On behalf of the Gray Family may we wish all of you a Happy Thanksgiving and may we all give proper thanks to our LORD for this great nation of ours and the great churches of our nation that hold the banner high uncompromisingly. GOTTA LOVE THE LORD!